Animal hormones are chemical signals that are secreted into the circulatory system and communicate regulatory messages within the body. Hormones reach all parts of the body, but only target cells are equipped to respond. Insect metamorphosis is regulated by hormones. 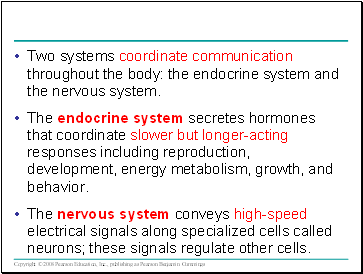 Two systems coordinate communication throughout the body: the endocrine system and the nervous system. The endocrine system secretes hormones that coordinate slower but longer-acting responses including reproduction, development, energy metabolism, growth, and behavior. The nervous system conveys high-speed electrical signals along specialized cells called neurons; these signals regulate other cells. 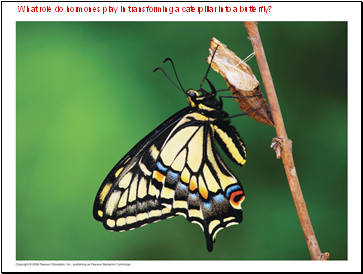 What role do hormones play in transforming a caterpillar into a butterfly? 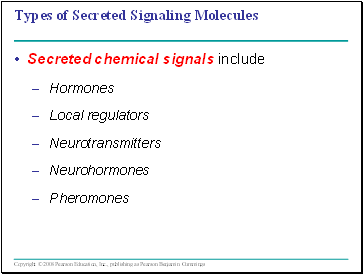 Chemical signals bind to receptor proteins on target cells. 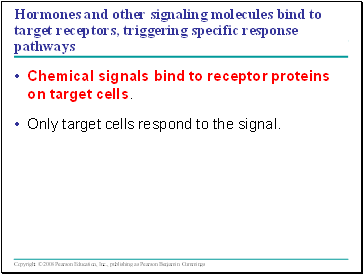 Only target cells respond to the signal. 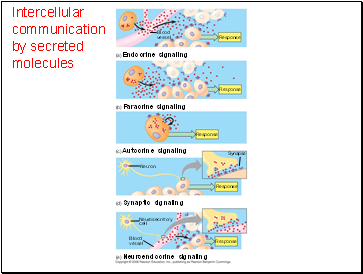 Endocrine signals (hormones) are secreted into extracellular fluids and travel via the bloodstream. 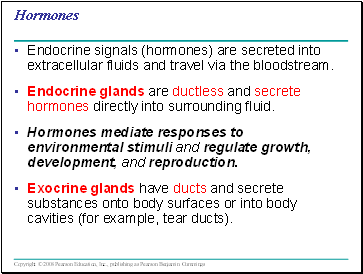 Endocrine glands are ductless and secrete hormones directly into surrounding fluid. 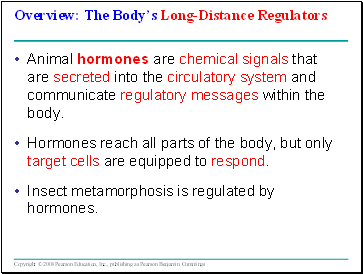 Hormones mediate responses to environmental stimuli and regulate growth, development, and reproduction. Exocrine glands have ducts and secrete substances onto body surfaces or into body cavities (for example, tear ducts). 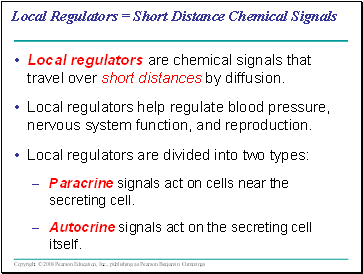 Local regulators are chemical signals that travel over short distances by diffusion. Local regulators help regulate blood pressure, nervous system function, and reproduction. Nontropic Hormones - target nonendocrine tissues.